Sharon and I are really hitting the cultural circuit here. 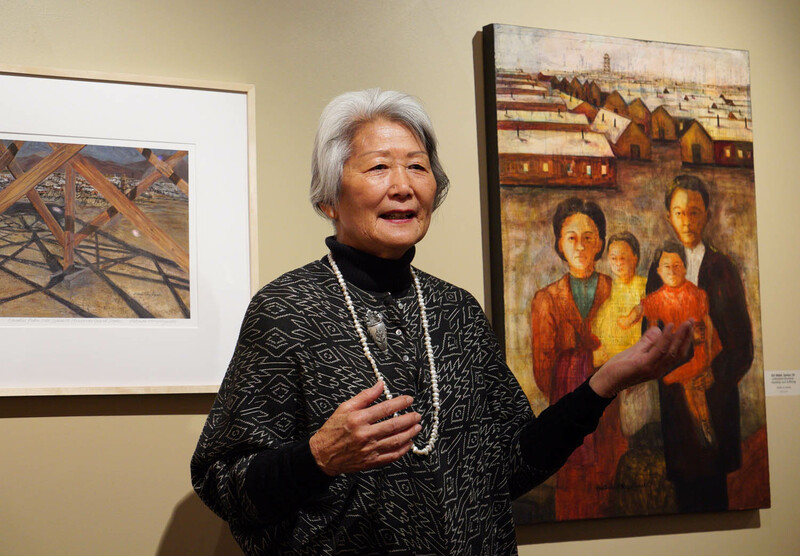 We attended an exhibit of art by Hatsuko Mary Higuchi Thursday evening at the Heart Mountain Interpretive Center. She was in the Poston, Arizona camp as a child and has recently done paintings and multimedia artwork on the incarceration experience. Many incorporate text or concepts like camp blueprints as the base of what she paints over. Higuchi gave a nice talk about her personal life that was followed by questions. Afterwards, I asked her which Poston camp she was in; that particular camp was so large it was divided into three sections. My parents were in Camp 3, so was Higuchi’s family. She asked me if I knew a photographer named Sachi Cunningham, I said, yes, that I know her from the Asian American Journalists Association annual conventions. Sachi is Higuchi’s niece and we were both surprised by the coincidence. Lois Spiering with son Kelly and daughter-in-law Sylvia, the daughters planting the garden. Earlier in the day we met with Lois Spiering and her family. 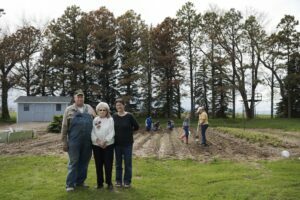 Her and her late husband Jim homesteaded and son Kelly still runs a farm on the family land. It’s increased now to over 600 acres. A daughter who just returned from college in Virginia couldn’t wait to get back to working on the farm. Kelly’s wife Sylvia said another daughter went away to school and said she missed the wind of the Big Horn Basin. “Who could ever miss the wind?” asked Sylvia. 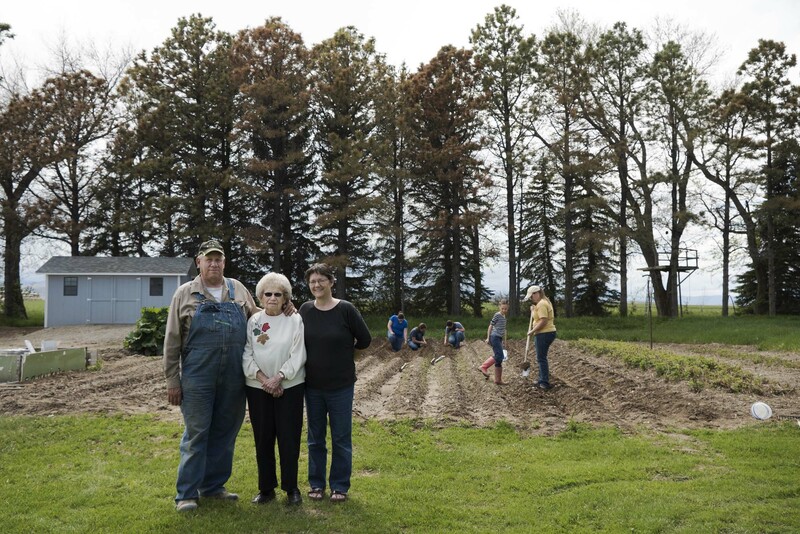 We took the portrait of Lois, Kelly and Sylvia with several of the daughters planting the garden, ponderosa pine trees planted as a windbreak by Jim almost 70 years ago towering in the background. 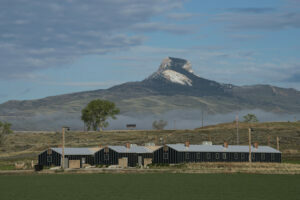 Early morning sun on the Heart Mountain Interpretive Center. Even earlier in the day I got up to see the sky relatively clear and a chance to have some blue sky in the photos and not gray rainclouds. As I drove towards Powell, I saw an amazing sight, a layer of fog above farmland just below Heart Mountain. I pulled over to get some shots of the scene, then drove on to the Interpretive Center to try an idea I saw earlier in the week. The sun rose brightly illuminating the barrack shaped buildings and the mountain top. The camp hospital boiler room smokestack. Just before the art exhibition, I wandered around the camp hospital boiler house smokestack, which still stands on a hill above the interpretive center, Heart Mountain visible on the horizon. 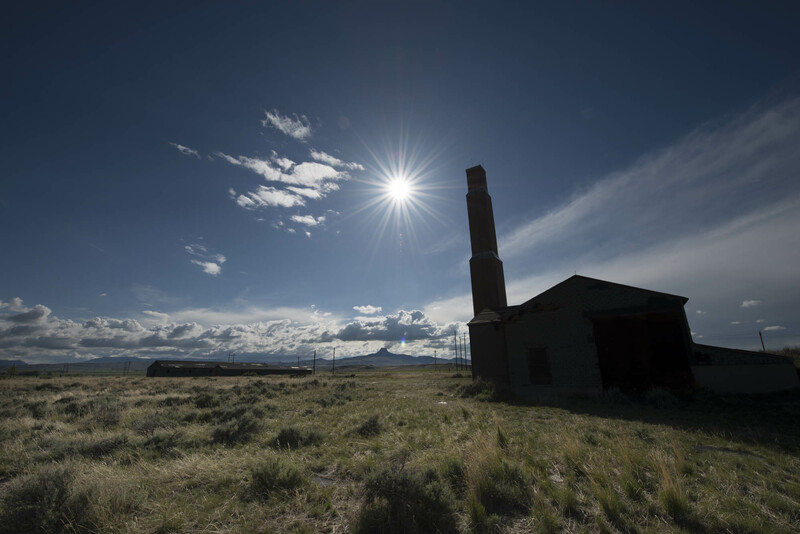 The dramatic structure, preserved through work of local people, the Heart Mountain Wyoming Foundation and grants, provided endless opportunities in the late afternoon sun. 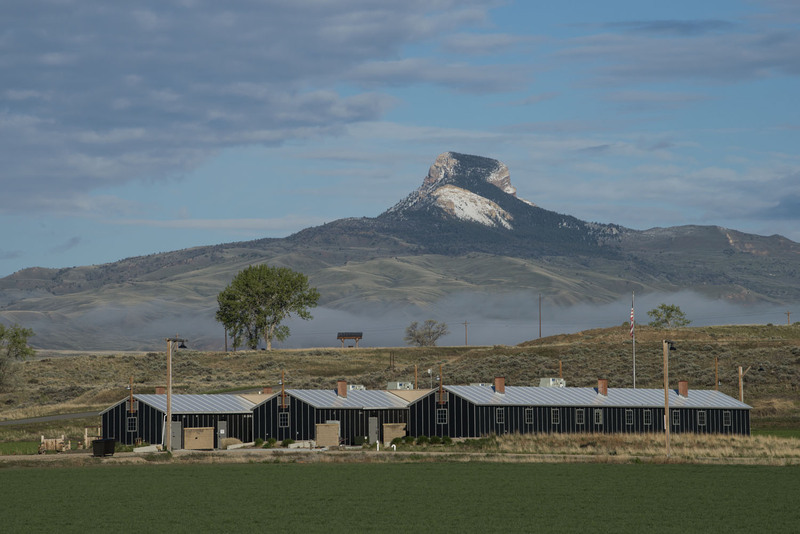 “Early Morning Sun on the Heart Mountain Interpretive Center” is the best photograph of that scene so far! Sure pays to keep doing back, doesn’t it? Now you can relax, because you have gotten it!